Our world values the beautiful and brilliant. That’s what we see in advertising, on the news, and on the stage. We are surrounded by their images. We are compelled to admire them and aspire to be like them. I admire the beautiful and the brilliant, too. Church Partnership, though not in the spotlight, will go down in history for me as one of the most beautiful and brilliant acts of love that I have witnessed in my life. River Oaks Community Church from Maryville, TN, is partnered with Fountain of Hope Church in Nairobi, Kenya, and have been partnering together to care for 25 vulnerable and orphaned children over the past nine years. River Oaks traveled to Kenya in August for the eighth time in over nine years of partnership. Our small team of four met at the airport with our backpacks loaded and passports in hand, eager to reunite with our Kenyan family. Unfortunately, we were grounded on the runway in Tennessee because of thunderstorms. We were a bit nervous, but hopeful that we would make our connecting flights in Philadelphia and London! With swollen ankles after sprinting through terminals, pouring sweat, and logging 24+ hours in planes and airports, we touched down completely exhausted on the Nairobi runway at 9:30 pm on Friday. Wheels on the ground never felt so sweet! Although we made it, our luggage did not. Getting through customs and filing lost luggage claims for our eight missing bags took another couple hours. But alas, once we located our driver, we breathed a sigh of relief. We settled into our guesthouse, grabbed a few hours of sleep, and we awakened to the morning that we had all been waiting for: Graduation Day! Filled with anticipation, we dressed in our three-day-old travel clothes and headed to the church. Humbled and saddened by attending a graduation ceremony without proper attire or personal toiletries lasted only until we arrived and were enraptured by the greetings and hugs of our dear family at Fountain of Hope. 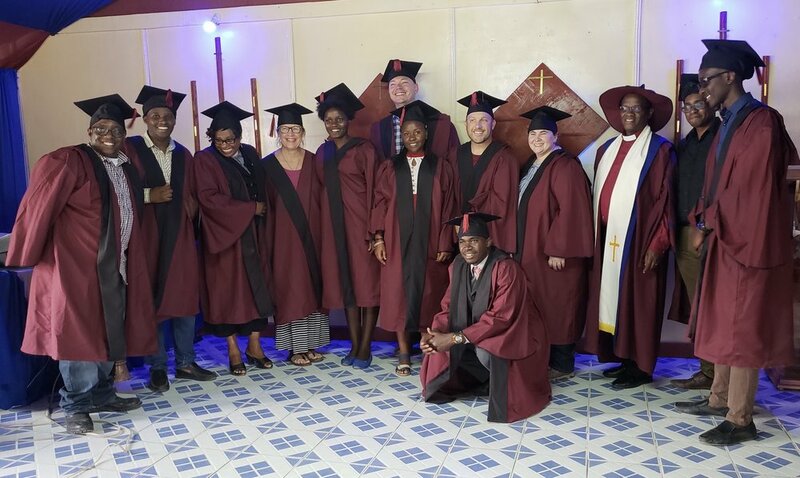 The first four graduates who had been wholistically cared for by the love of our Church Partnership were moving on to further their education and step into the next season of life! This was nothing short of miraculous. With celebration music playing in the background, sheer excitement filled the air. We’re here to celebrate you and want to congratulate each of you! We are going to cut this beautiful cake and serve it in your honor, but let us ultimately give honor to our Lord today. As others were sharing, I was thinking about the fact that we do what we do in serving and loving one another because of what has already been done by the sacrificial work of Jesus Christ. He is the one who sacrificed his own blood on the cross that would reconcile everything on earth and in heaven to himself. He is the one who paid the debt for our sin that we owed, yet could not pay. He brought us near to the Father, and he brought us near to each other from different countries. Having been set apart for God and for each other, we all have the privilege of being family and ministers of his grace through the power of the Holy Spirit. We get to share the hope we have in Christ with the world. We love each other because he first loved us. We bless one another because he has blessed us. Being a part of each other’s lives is a privilege and an honor. I want to encourage you to keep your eyes on Jesus. Find your direction and purpose in his kingdom and follow in his ways. Oh, love him. Love him the most. We love you so much and are so honored to be here! Congregants at Fountain of Hope Church have loved these children like their own. They have walked with them through some of the most challenging and restorative years of their lives. I felt many mixed emotions that day (just as I did with my own children on graduation day), as there are always unknowns with moving away to college. Will they have the support they need? Will they meet friends who know and love Jesus? Will they have someone to encourage them on discouraging days? Who will help them with their homework? We had the opportunity to lay hands on our graduates and pray for them at the end of the ceremony, and there was a sense of release and confidence for my heart. Indeed, these kids are his and he will continue to provide all that they need. Spiritual care in the context of Church Partnership looks a lot like family! The annual week we share together includes both family celebrations as well as the shedding of tears from time to time. Our two churches celebrated the first four graduates and three of our birthdays. In the same week, we also grieved the loss of a beloved friend who tragically passed from cancer, leaving five children behind. Spiritual care in the context of cross-cultural partnership looks like mutuality where neither is better than the other. We are all vulnerable in our own ways, and we all have the same fundamental need—real hope that only Christ can provide! As we come alongside others to care for them, they care for us in our vulnerability. Those we teach and visit, wind up teaching us and visiting our hearts as we take the time to engage, listen, and learn. Those tender and gut-wrenching moments that are exposed in prayer intersect the vulnerability in all of us. The graduation ceremony was not just the turning of another page for four amazing young people. This ceremony was a launching pad for all that has been accomplished and for all that is to come for these precious lives who have put their trust in Christ. They will now go into the world, and my hope is that they, too, will proclaim the Gospel, care for the vulnerable, and make disciples of all nations.